It is always with anticipation that one approaches a review of a 4 1/2 star golf facility (Golf Digest). 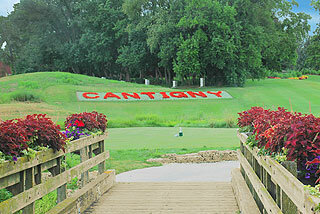 Many things have to fall into place for a golf property to achieve that rating - and Cantigny Golf has it all. I was pleasantly surprised to find the course remarkably green on Easter Morning, especially since 3 inches of snow covered the ground just 2 weeks earlier. Even more remarkable were the conditioning of the putting surfaces, bunkers, tee areas and fairways. 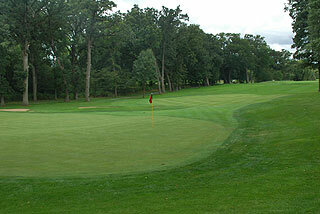 Though the trees were relatively leafless, the course remained aesthetically beautiful. The spacious grass range, with target greens and bunkers, was open for public use - as well as the double-tiered putting green and short game area with two greens for chipping and sand practice. Cantigny offers an abundance of instructional programs, and participants are able to "hone their game" under playing conditions on the well kept bent grass tee areas. What's more, there is a Youth Links featuring 9 holes ranging from 75 - 175 yards, designed exclusively for juniors between the age of 8 and 15 - to work on their game once they have completed a certification program. The clubhouse at Cantigny leaves nothing to be desired, providing amenities that would make many private clubs envious. A full service pro shop is stocked with equipment, apparel and accessories, and is located above spacious locker room facilities (the men's had141 lockers) that feature 9 separate showers stalls in each (men's and women's) and toiletry items that are complimentary to guests. The Fareways Restaurant and lounge is open in season from 11AM - 3 PM for lunch, and from 10 AM - 2 PM FOR Sunday brunch. The clubhouse lounge also serves light fare as well as all the favorite libations - and both dining areas along with outdoor patios provide spectacular views of the golf course. These facilities also can accommodate up to 200 people for banquets, meetings, outings and other special events. But even with all the special amenities - golf remains the main draw. Cantigny presents 3 outstanding Roger Packerd designed nine hole courses - that can be played as nine or eighteen-hole layouts. 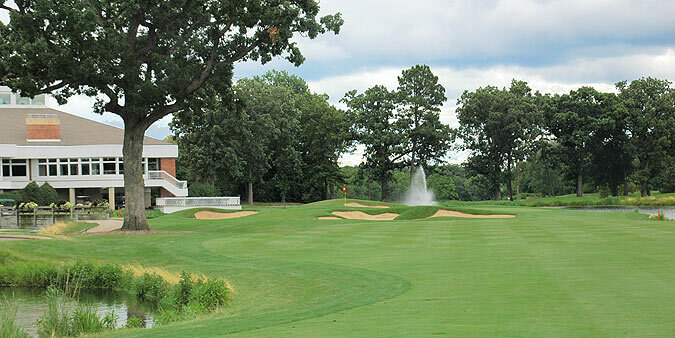 Soon after opening, Cantigny was selected as the "Best New Public Course in America" and since has been honored as a "Top 50 You Can Play" in the country. 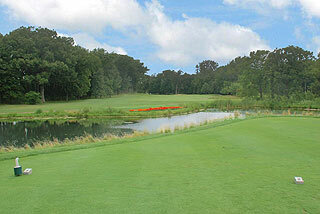 In 2014, the course is hosting both the Illinois State Amateur and the Chicago Open. From the first tee shot until we crossed the bridge leading to the 9th green on the Lakeside Courses, we found this golf property to be worthy of all the accolades. The Woodside nine plays to 3545 from the tips, and possesses character in the form of natural ponds, willows, pines and hardwoods - with wooden bridges dotting the property. 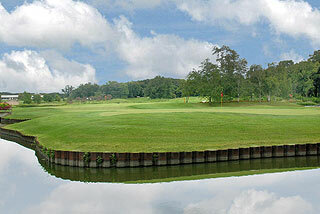 Water comes into play on five of the holes, and is never far from view. 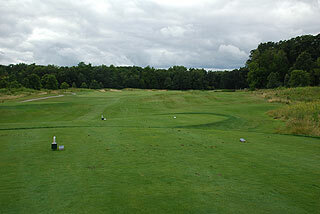 There is a nice mix of open and tight driving holes, with most providing ample room off the tee. Those hitting from the tips on the Woodside/Lakeside 18 will be staring at a 140 slope rating, while the mid tees measure 3208 with a 132 slope. Forward tee players get quite a break on the more demanding holes, as the reds play to 2736 yards and a slope of 127/120. The is only one par four measuring over 400 yards from the mid tees, and the 2 par fives play to 509 and 498 yards. 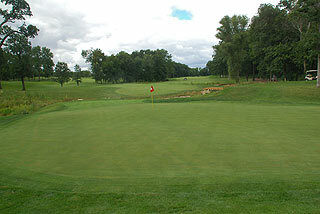 With the quick and well conditioned putting surfaces only mildly undulating, scoring your handicap here is a good bet. This is especially true for those with a left to right shot shape, as all 4 doglegs bend to the right. Of particular note is the interesting par 5 second - a true 3 shot hole with a creek dividing the fairway into sections as it winds in front of and right of the green. There is about 75 yards of target landing area from the 100 marker in - between the branches of the snaking water hazard. Number 8 is also a beauty. There is about 15 yards of grass in front of and 5 yards of room behind this double island green. A soft, arcing shot off the tee is necessary here. Water also comes into play quite suddenly on the closing hole - as the entrance to the green narrows considerably. Mounding on the right may help to funnel shots hit towards that side to the center of the green. Even with a bunker on that side - this is a safer alternative that approaching near the hazard to the left. 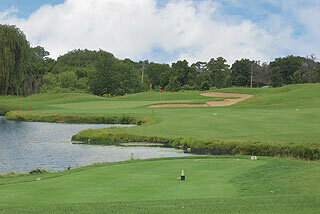 The Lakeside nine, like the Woodside, opens with an easy par four that is also followed by the number one handicap. This 600 yard (from the tips) par five has a water hazard short right and another long left that will come into play on the second shot for most golfers. A mature willow on the right and a row of hardwoods left make the approach demanding. Also note the hidden pond to the left on number three - stay to the right center as this hazard is very reachable off the tee. The par three 8th is easy except for the triple tiered putting surface - an exception to the rule of mild undulations on the greens at Cantigny. Each cart is provided with a pin placement sheet with 9 locations for each hole. Pay attention to the days placement here. The ninth is a classic hole - and the one I will remember Cantigny for...A formidable water hazard on the right will affect your tee shot, and another on the left may come into play on the approach - which must be extremely accurate as more water is waiting behind the green. 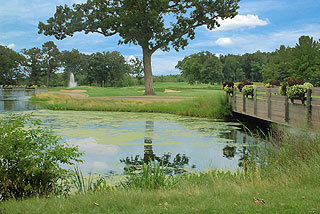 This hole will demand your best - a fitting ending to a wonderful round of golf! Great golf, great food, great service and a wonderful private club atmosphere. Cantigny is truly deserving of the high ratings, and is a real treat, even at $100 a round prime time (including cart). Amenities include a complimentary tee pack - and the golf carts have weather covers to keep your clubs dry in case of rain.The course is well marked with yardages measured to the center of the green on all tee boxes and on sprinkler heads. A nice touch are the color coded maple leafs (red 100, white 150, blue 200) painted on the cart paths. This one is highly recommended by the Two Guys Who Golf. 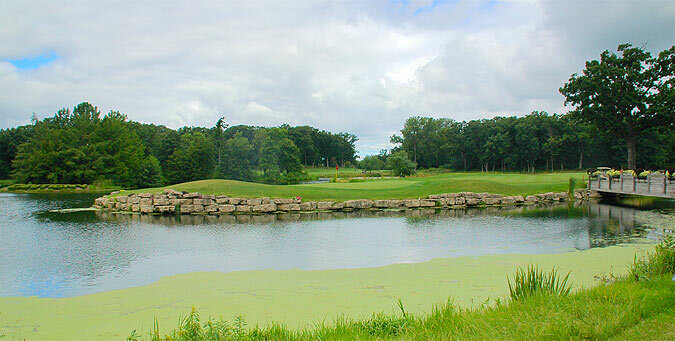 For more information on this course and a link to its website (if available) visit our detailed listing page in the Two Guys Who Golf Chicago Section: click here.